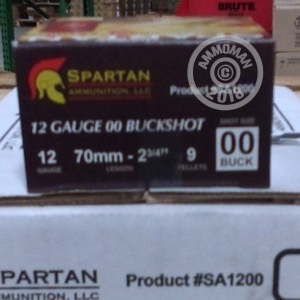 These 12 gauge shells from Spartan fire 9 pellets of 00 buckshot. Each shotshell measures the standard 2-3/4" long and fires at a muzzle velocity of 1315 feet per second. This ammo is great for any 12 gauge use -- from self defense to taking down a deer. Spartan's economical shell features low brass and is designed to produce a tight shot pattern. All of their ammo goes through extensive testing to maintain strict quality control measures. Place an order over $99 and get free shipping!